John R. Buric « James McElroy & Diehl, P.A. John obtained his bachelor of science in civil engineering from North Carolina State University, before obtaining his J.D. from Boston University School of Law. 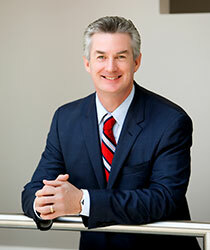 He focuses his practice on complex litigation disputes in both state and federal court, and has practiced extensively in the North Carolina Business Court. Having litigated more than 80 jury trials, John is a personable and persuasive individual, highly skilled in the art of presenting large amounts of complicated information in a manner that is concise and approachable. His specialties include helping clients face litigation pertaining to a wide variety of business disputes, including management disputes, employment disputes, shareholder disputes, breaches of corporate documents (i.e. asset purchase agreements and operating agreements), appointment of a receiver, real property disputes, construction disputes, catastrophic personal injuries, and wrongful death. In addition, John has significant experience defending and prosecuting alienation of affection and criminal conversation claims. Comfortable serving as a lead counsel, John has built a reputation based on tenacity, professionalism and most importantly, success. Formerly in the U.S. Navy, John is a fierce protector of his clients’ best interests. John has a comprehensive understanding of the entire litigation process, from fact gathering in discovery through the trial. In addition, John can carry his cases through the appeal, having argued numerous times in the appellate courts, including the North Carolina Court of Appeals, the North Carolina Supreme Court, and the United States Court of Appeals for the Fourth Circuit. As a result of his experience and knowledge, John is frequently invited to speak on topics related to his practice areas.